“TEEN TITANS GO! TO THE MOVIES” is coming to theaters only July 27th. 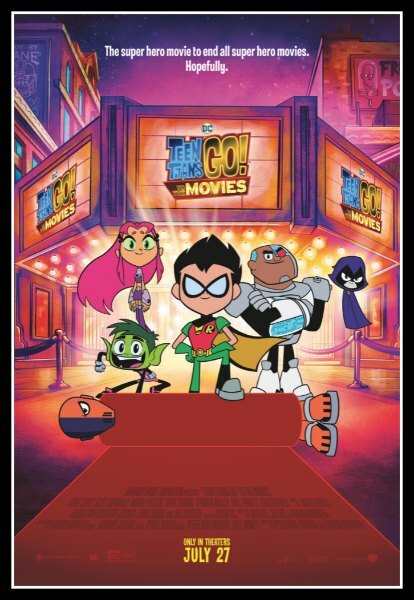 When the Teen Titans go to the big screen, they go big! “TEEN TITANS GO! TO THE MOVIES” finds our egocentric, wildly satirical Super Heroes in their first feature film extravaganza—a fresh, gleefully clever, kid-appropriately crass and tongue-in-cheek play on the superhero genre, complete with musical numbers. It seems to the Teens that all the major superheroes out there are starring in their own movies—everyone but the Teen Titans, that is! But de facto leader Robin is determined to remedy the situation and be seen as a star instead of a sidekick. If only they could get the hottest Hollywood film director to notice them. With a few madcap ideas and a song in their heart, they head to Tinsel Town, certain to pull off their dream. But when the group is radically misdirected by a seriously Super-Villain and his maniacal plan to take over the Earth, things really go awry. The team finds their friendship and their fighting spirit failing, putting the very fate of the Teen Titans themselves on the line! Giveaway has ended: WINNER: Kelly S.
I was sent some movie swag and a family four pack of tickets good at any U.S. movie theater that accepts Fandango. Since my family and I already caught an advanced screening I’m sharing those tickets with you! 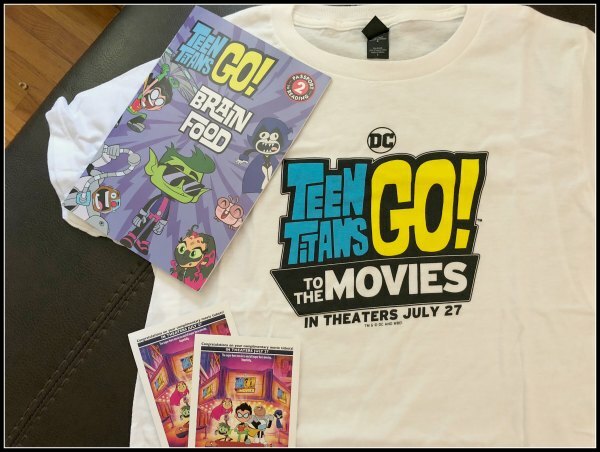 1 lucky winner will win the family four pack of tickets to see Teen Titans Go! To the Movies! Giveaway is US only and ends on July 27, 2018. Good Luck! My kids love Teen Titans Go! I’ll admit that I like them too. Following on twitter @nothingbutroomb. Also follow on IG @nothingbutroomblog. My nephew loves Teen Titans Go. He is really excited to see this movie. I think we are going to go next week. https://twitter.com/BWallace1980/status/1020606858908848128 Tweet for 7/21/18 Thanks for hosting. Would love to win because we enjoy going to the movies especially in the summer months. https://twitter.com/BWallace1980/status/1020977796183724032 Daily Tweet for 7/22/18. This movie looks like alot of fun. I would love to win. Thanks so much for the chance. We LOVE Teen Titans Go in our house! This would be an awesome prize for my family! Would love to win this prize! I would love to win and take my kids! thank you for the chance! I would love to win this for my nephews! I’d love to win, thank you. I would love to win this to take my son. Thank you for the giveaway! My kids love Teen Titans and look forward to the movie. My son would love id we had these ? Both of my kids are excited to see this movie coming to theaters! They would love this prize. We love to go to the movie! I think my kids would have fun with this. My girls love Teen Titans Go!This would be awesome for them!!!!! I would love to take my son to see this film. I’d love to win! My kids have always liked Teen Titans (and sshhh…so do I). I bet the movie will be fun! The little ones would so love this! I want this! My son would flip! I would love to win this prize! Thanks for the giveaway! !